Name meaning 'urine', referring to its medicinal properties. Reaching around 60 cm tall, has small alternate leaves resembling those of the mimosa tree, disposed in two ranges. The leaves are large at the tip and smaller towards the petiole. When touched, the leaves fold in automatically. Flowers are greenish white, minute and appear at axiles of the leaves, as well as the seed capsules. 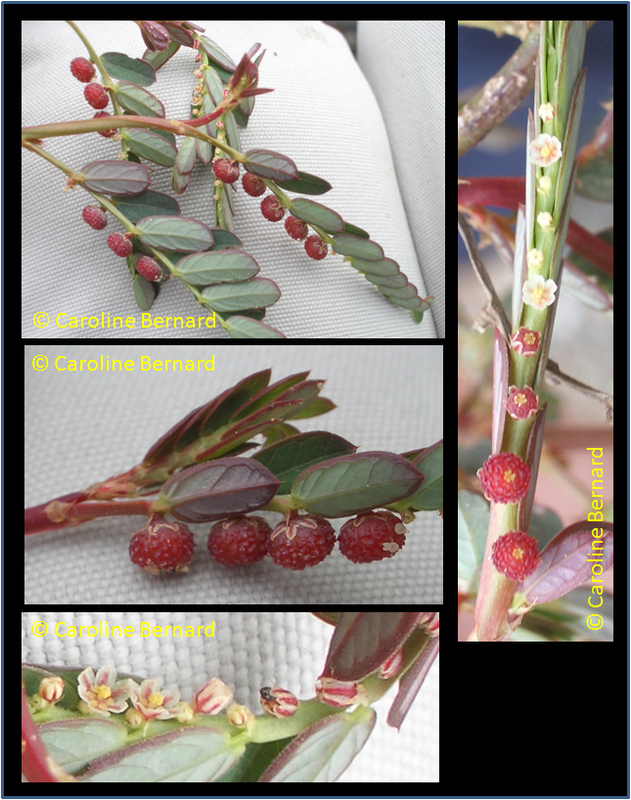 Numerous small green-red fruits, round and smooth, are found along the underside of the stems, which are erect and red. Dry fields, roadsides, wastelands, forest margins; below 100-600 m.
Used in China to promote healthy elimination of gallstones and kidney stones, as an immune system stimulator and for those with liver disease. Whole (sub)tropical Asia. Currently widespread across the tropics. English: Chamberbitter, Gripeweed, Shatterstone, Stonebreaker or Leafflower.